Canada's housing market is always a hot topic, but this week it was a heretofore little-known mortgage lender called Home Capital that made headlines as clients withdrew hundreds of millions in savings in a matter of days. Shares in alternative mortgage lender plunged this week, but how far could the damage spread? Here's everything you need to know about the unfolding story — and what, if anything, it could mean for the housing market as a whole. 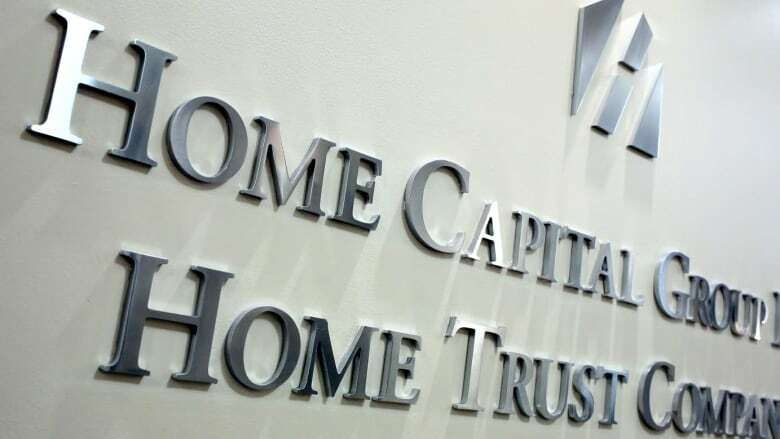 Home Capital is the parent company of a number of federally regulated financial institutions including Home Trust, Home Bank and Oaken Financial. While they compete in six provinces with big banks, credit unions and other companies for business, they target "segments of the Canadian financial services marketplace that are not the focus of the major financial institutions," Home Capital says on its website. While Home Capital offers a full complement of services including credit cards, GICs and savings accounts, it makes most of its money selling uninsured mortgages to clients who the big banks don't cater to, usually because they have spotty credit histories, are self-employed or have otherwise uneven incomes. Why is the company suddenly in the news? The company's problems began last week when the Ontario Securities Commission alleged that several company executives broke securities laws and misled shareholders in their handling of a scandal involving falsified documentation for a bunch of mortgages almost two years ago. In the summer of 2015, Home Capital announced it had cut ties with about 45 mortgage brokers for fudging the numbers as to how much prospective borrowers were earning when they applied for a mortgage. Home Capital said at the time that none of the borrowers in question had any problems paying off their loans, and the company's financial results since then have backed that up. But the company's stock was hit hard this week as the OSC's allegations sparked fears the company may have loaned out too much money to homebuyers who may not be able to pay them back in an overheated housing market. Home Capital's shares plunged 65 per cent on Wednesday amid those fears, and word that savers were withdrawing money. They rebounded a little on Thursday after the company secured a $2-billion line of credit from the Healthcare of Ontario Pension Plan, but a cloud of uncertainty remains, especially since that lifeline comes with a catch: an interest rate of more than 22 per cent on the first $1 billion. Usurious rates like that stoke fears the company is desperate for cash, and could further contribute to a run on the bank, analyst Marc Charbin of Laurentian Bank said in a note this week. Savers have been pulling money out of the company at a feverish pace all week. At the end of March, Home Capital had about $2 billion in cash savings. By Monday, that figure had fallen to $1.4 billion. By Friday, it was about a third of that. The fact that many investors are withdrawing their money as a precaution is bad news for Home Capital, but the real pain could come later this year when the $13 billion they have in locked-in GIC's is available to be taken out. "If investors pull money out of that, that will exacerbate the problem even further," said Cynthia Holmes, a professor of real estate management at Ryerson University in Toronto. "It's a very serious problem when their deposits dry up," because they have to offer higher and higher returns in a vicious circle to attract new investment. Paul Harris, a partner and portfolio manager with Avenue Investment Management, says Home Capital has a trust issue and that's often the beginning of the end for a financial company. "I think it would be very hard for them to [survive] unless they can get confidence back in the company," he told CBC's On The Money this week. "I don't know what they need to do, but ... the reality is that people are going to think very hard about giving them money." If the company can't stem the tide of withdrawals to secure the money it needs to loan out new mortgages, some sort of wind down or sale of the company is possible. "Worst case," analyst Marc Charbin said, "Home Capital will be unable to renew or originate mortgages in order to service a decline in funding." TD analyst Graham Ryding agrees, and says "the company will likely move into liquidation mode." What would that do to the housing market? That situation sounds dire, but it wouldn't necessarily be that traumatic to the housing market as a whole. For starters, anyone with money in a savings account or GIC worth less than $100,000 at Home Bank or Home Trust is 100 per cent covered by the Canada Deposit Insurance Corporation, so there's no risk of losing money there. And the company's core business — the mortgages for which the vast majority of clients are making their payments — are still valuable assets that other lenders would likely be more than happy to get their hands on. Less than 0.3 per cent of the company's loans were considered delinquent at the end of last year, so it's not as if Home Capital has a large number of bad borrowers. But the company hired investment bankers at RBC and BMO this week to advise it on "strategic options," so some sort of sale of the company either in whole or in part is certainly on the table. As for the borrowers, Holmes says as long as they keep making their payments, they shouldn't have any problems renewing their mortgages when the time comes. But, unfounded though they may be, there are clearly fears of Home Capital's problems spreading to other fringes of the housing market. With about $16 billion worth of mortgages on its books, Home Capital makes up less than one per cent of the total market, but many wonder if it may be the canary in the coal mine. Other alternative lenders such as Street Capital and Equitable Group saw their share prices fall precipitously this week despite having no role in the story, and even some of the big banks moved lower. The real problem if Home Capital ceases to exist, Holmes says, is that consumers have one less option for mortgages, and that's bad news for everyone. "It impacts more people who are not yet in the market," she said. "They will find it hard to find these alternative lenders to get money with a lower credit rating."